In addition to the many uses of hydrogen fluoride (HF) as a process chemical, it is also used in important industrial applications as a catalyst. A catalyst is a material which promotes a chemical reaction without itself being consumed in the reaction. The use of a catalyst yields benefits in terms of process efficiency and economy. In the petrochemical industry the naturally occurring components of crude oil are traditionally separated by the process of distillation. However, this process does not change the relative proportions of the individual components, some of which have a higher commercial value than others. The process of alkylation, where Hydrogen fluoride (HF), is employed as a catalyst, offers an opportunity to increase the yield of petroleum grade fractions. Typically, low boiling fractions such as propylene and butylene are reacted with isobutane to generate high-octane products. They contribute to produce a fuel which burns efficiently, providing a longer engine life and lower emissions. 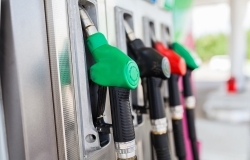 By boosting the octane rating of fuels, alkylates avoid the need for such environmentally harmful substances as lead, without compromising engine performance.